Objective We evaluated the efficacy and safety of ledipasvir/sofosbuvir alone and with ribavirin for 8 and 12 weeks in Egyptian patients with and without cirrhosis, who were infected with hepatitis C virus (HCV) genotype 4, including those who had failed previous treatment with sofosbuvir regimens. Design In this open-label, multicentre, phase III study, treatment-naive patients were randomised to receive 8 or 12 weeks of ledipasvir/sofosbuvir±ribavirin. Interferon treatment-experienced patients were randomised to receive 12 weeks of ledipasvir/sofosbuvir±ribavirin, while sofosbuvir-experienced or ledipasvir/sofosbuvir-experienced patients received 12 weeks of ledipasvir/sofosbuvir+ribavirin. Randomisation was stratified by cirrhosis status. The primary endpoint was sustained virological response 12 weeks post-treatment (SVR12). Results We enrolled 255 patients from four centres in Egypt. Among treatment-naive patients, SVR12 rates were 95% and 90% for those receiving 8 weeks of ledipasvir/sofosbuvir alone and with ribavirin, respectively, and 98% for those receiving 12 weeks of ledipasvir/sofosbuvir both alone and with ribavirin. Among interferon-experienced patients, SVR rates were 94% for those receiving 12 weeks of ledipasvir/sofosbuvir and 100% for those receiving 12 weeks of ledipasvir/sofosbuvir plus ribavirin. All patients previously treated with sofosbuvir regimens who received ledipasvir/sofosbuvir plus ribavirin achieved SVR12. The most common adverse events, headache and fatigue, were more common among patients receiving ribavirin. Conclusion Among non-cirrhotic treatment-naive patients with HCV genotype 4, 8 weeks of ledipasvir/sofosbuvir±ribavirin was highly effective. Twelve weeks of ledipasvir/sofosbuvir±ribavirin was highly effective regardless of presence of cirrhosis or prior treatment experience, including previous treatment with sofosbuvir or ledipasvir/sofosbuvir. In Egypt, which has one of the highest prevalences of hepatitis C virus (HCV) infection in the world (6.3%), >90% of patients are infected with HCV genotype 4. At the time of study design, sofosbuvir was the only direct-acting antiviral (DAA) drug available in Egypt. As such, the only DAA treatment options were sofosbuvir plus ribavirin plus pegylated interferon for 12 weeks, or sofosbuvir plus ribavirin for 24 weeks; there were no treatment options for patients who had failed direct-acting antiviral agent therapy. We sought to find the optimal regimen for ledipasvir–sofosbuvir in Egypt. Shorter treatment durations and/or the removal of ribavirin and pegylated interferon and their associated toxicities would be of benefit to patients. Treatment-naive patients without cirrhosis were effectively and safely treated with the fixed-dose combination of ledipasvir/sofosbuvir for 8 weeks. 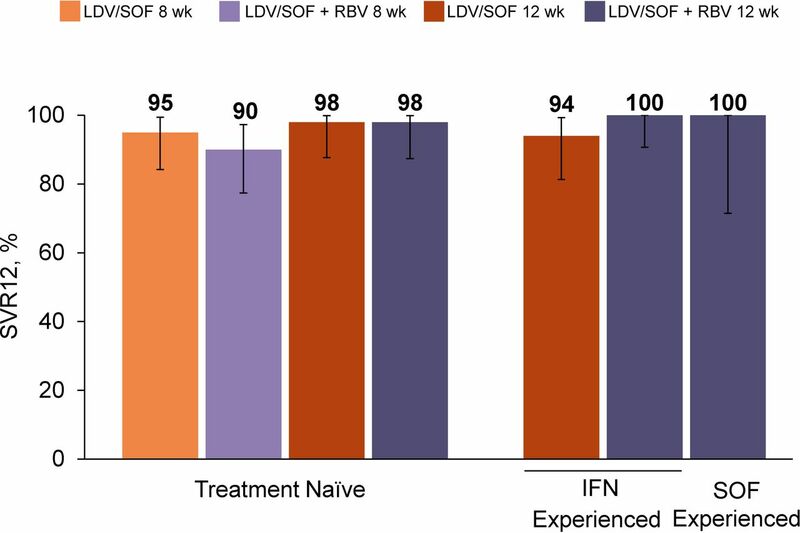 Rates of sustained virological response 12 weeks post-treatment (SVR12) of ≥94% were observed with 12 weeks of ledipasvir/sofosbuvir±ribavirin treatment in interferon-experienced patients with or without cirrhosis. All sofosbuvir or ledipasvir–sofosbuvir-experienced patients in this study achieved SVR12 with 12 weeks of ledipasvir–sofosbuvir plus ribavirin for 12 weeks. Overall, the addition of ribavirin did not appear to increase rates of SVR observed with ledipasvir–sofosbuvir, but it was associated with an increase in the incidence of adverse events. Ledipasvir/sofosbuvir for 8 or 12 weeks is an effective and well-tolerated treatment for HCV genotype 4 infection, without any of the safety concerns associated with ribavirin therapy. In addition, a shorter treatment duration of 8 weeks represents a treatment option for treatment-naive patients without cirrhosis. 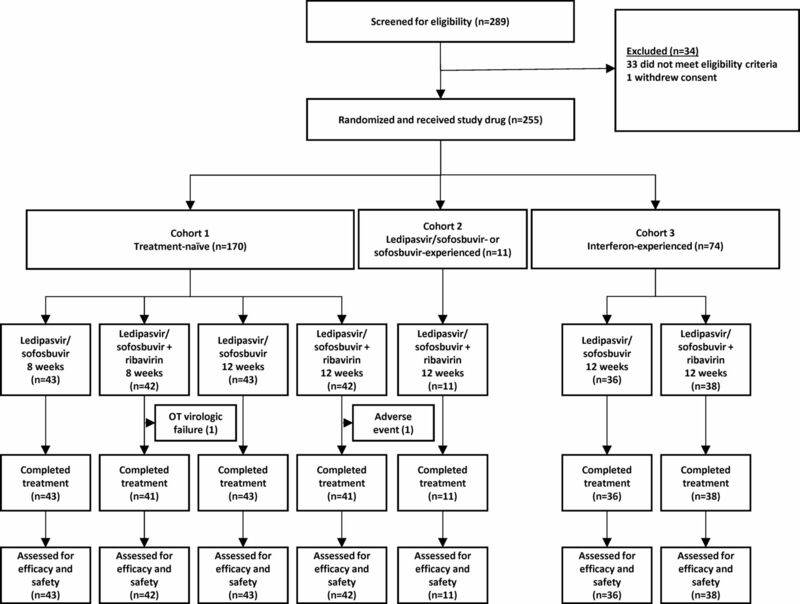 Shorter treatment durations and the benefit of once-daily, single-tablet regimens should improve patient adherence and help reduce the considerable burden of HCV on Egypt’s healthcare system. We conducted this phase III study to evaluate the safety and efficacy of ledipasvir–sofosbuvir with and without ribavirin for 8 or 12 weeks in Egyptian patients with HCV genotype 4, including those with cirrhosis and those who had previously failed treatment with an interferon or sofosbuvir-based regimen. This multicentre, randomised, open-label, phase III study enrolled adults (≥18 years) with chronic HCV genotype 4 infection. At screening, treatment-naive or interferon-experienced patients had plasma HCV RNA levels of at least 104 IU/mL sofosbuvir-experienced or ledipasvir–sofosbuvir-experienced patients had HCV RNA levels greater than the lower limit of quantitation (LLOQ), or 15 IU/mL. Patients with or without compensated cirrhosis were eligible. Patients with hepatic decompensation, co-infection with hepatitis B virus or HIV, or contraindications to ribavirin therapy were excluded. Detailed inclusion/exclusion criteria are presented in the online supplementary appendix. Patients were enrolled in three cohorts. Treatment-naive patients (cohort 1) were randomly assigned in a 1:1:1:1 ratio to one of four treatment groups: ledipasvir–sofosbuvir for 8 weeks, ledipasvir–sofosbuvir+ribavirin for 8 weeks, ledipasvir–sofosbuvir for 12 weeks or ledipasvir–sofosbuvir+ribavirin for 12 weeks. In cohort 2, patients who had received sofosbuvir plus ribavirin for 12 or 24 weeks as part of a prior study (ClinicalTrials.gov, NCT01838590) but had failed to achieve SVR1215 or patients who had participated in cohort 1 of the current study and failed to achieve SVR12 with 8 weeks of ledipasvir–sofosbuvir±ribavirin were enrolled to receive ledipasvir–sofosbuvir+ribavirin for 12 weeks. Cohort 3 included interferon-experienced patients with no prior exposure to a direct-acting antiviral targeting HCV NS5A or NS5B polymerase. These patients were randomised in a 1:1 ratio to ledipasvir–sofosbuvir or ledipasvir–sofosbuvir+ribavirin for 12 weeks. Patients in cohorts 1 and 3 were stratified according to cirrhosis status. Ledipasvir–sofosbuvir was administered orally as a fixed-dose combination tablet (90 mg ledipasvir and 400 mg sofosbuvir), once daily. Ribavirin was administered twice daily, with food, at a total daily oral dose of 1000 or 1200 mg for patients weighing <75 kg or ≥75 kg, respectively. Dose reductions and discontinuation of ribavirin were allowed in accordance with the product label. The primary efficacy endpoint was SVR12 (the proportion of patients with HCV RNA <LLOQ 12 weeks post-treatment). The primary safety endpoint was any adverse event leading to permanent discontinuation of study drug(s). HCV RNA levels were determined using the Ampliprep/TaqMan HCV Test, V.2.0 (Roche Molecular Systems, Branchburg, New Jersey, USA), which has a LLOQ of 15 IU/mL. Presence of cirrhosis was defined as liver biopsy with Metavir stage 4 or Ishak score of 5 or 6, a Fibroscan >12.5 kPa, or FibroTest score >0.75 and AST:platelet ratio index >2. Safety assessments included clinical laboratory tests, physical examinations and vital signs measurements. Adverse events were monitored and documented throughout the study period. Although analyses of virological resistance were planned, samples collected for viral sequencing could not be analysed due to logistical obstacles. Efficacy and safety were analysed in all randomised patients who received at least one dose of study drug. SVR12 was calculated for each treatment group using the exact binomial distribution with a two-sided 95% CI based on the Clopper-Pearson method. Other efficacy measurements were summarised using descriptive statistics. A sample size of at least 40 patients per treatment group in cohorts 1 and 3 was calculated to provide a two-sided 95% exact CI that would extend at most 32% in length, or 16% in either direction. The study was not powered to compare efficacy among treatment arms. Any patient with missing data due to premature discontinuation of the study drug was considered a failure at the date of discontinuation and all subsequent time points. If no HCV RNA values were obtained after the last dose of study medication, the patient was considered a treatment failure for the SVR endpoints. Adverse events were coded using the Medical Dictionary for Regulatory Activities, V.19.1. Safety data were analysed descriptively according to treatment received. All statistical summaries and analyses were performed using SAS software (V.9.4; SAS Institute, Cary, North Carolina, USA). The study was approved by an independent ethics committee or institutional review board at all participating sites and was conducted in accordance with the principles of the Declaration of Helsinki and International Conference on Harmonization guidelines and complied with local laws and regulations. Written informed consent was obtained from all patients. All authors had access to the study data and approved the final version of the manuscript. The study was conducted from 7 September 2015 to 11 November 2016 at four centres in Egypt. Of the 289 patients screened, 255 were enrolled and received at least one dose of study drug. The majority of patients not enrolled (33 of 34) did not meet eligibility criteria; one patient withdrew consent prior to enrolment (figure 1). In total, cohorts 1 and 3 enrolled 170 and 74 treatment-naive and interferon-experienced patients, respectively. Cohort 2 enrolled six patients from study NCT01838590 and five patients from cohort 1 of the current study. Only two patients (1%) discontinued study treatment prematurely; one had on-treatment virological failure at week 2 due to meeting the predefined stopping criteria of a confirmed >1 log increase in HCV RNA from on-treatment nadir and one discontinued due to an adverse event (car accident) at week 8. Of the 255 patients in the study, 61% were men, 67% were treatment-naive, 21% had cirrhosis and 80% had IL28B non-CC genotype (table 1). Baseline characteristics were generally balanced across the treatment groups, except that the treatment-experienced cohorts (2 and 3) had a greater proportion of men (66%–89%) and patients with cirrhosis (26%–28%) compared with the treatment-naive groups (51%–58% and 16%–21%, respectively). SVR12 rates are shown in figure 2. Among treatment-naive patients who received 8 weeks of treatment, the SVR rates were 95% (41/43; 95% CI 84% to 99%) without ribavirin and 90% (38/42; 95% CI 77% to 97%) with ribavirin (table 2). Notably, among the 71 treatment-naive patients without cirrhosis treated for 8 weeks, an overall SVR12 rate of 94% was observed (67/71; 95% CI 86% to 98%); 91% with ribavirin (32/35, CI 95% to 77% to 98%) and 97% without ribavirin (35/36, CI 95% 86 to 100%). Among the 71 patients without cirrhosis, 69 had a baseline HCV RNA <6 million IU/mL; among these patients, the same SVR rates by treatment were observed (94% overall, 91% and 97% with and without ribavirin, respectively). Proportion of patients achieving SVR12. Error bars represent 95% CIs. All patients who did not achieve SVR12 experienced virological relapse except one treatment-naive patient who received LDV/SOF+RBV for 8 weeks (on-treatment virological failure), one treatment-naive patient who received LDV/SOF+RBV for 12 weeks (relapse after early discontinuation due to a serious adverse event) and one IFN experienced patient who received LDV/SOF for 12 weeks (achieved SVR4, but died prior to post-treatment follow-up week 12). IFN, interferon; LDV, ledipasvir; RBV, ribavirin; SOF, sofosbuvir; SVR12, sustained virological response at 12 weeks post-treatment. The SVR rates among treatment-naive patients treated for 12 weeks was 98% with (41/42; 95% CI 87% to 100%) or without ribavirin (42/43; 95% CI 88% to 100%). Among treatment-naive patients who did not achieve SVR12, six experienced post-treatment virological relapse, one patient had on-treatment virological failure and one patient early discontinued study treatment due to a serious adverse event of car accident. Of the six treatment-naive patients who relapsed, two patients received ledipasvir–sofosbuvir for 8 weeks, three received ledipasvir–sofosbuvir plus ribavirin for 8 weeks and one patient received ledipasvir–sofosbuvir plus ribavirin for 12 weeks. The five patients who relapsed after 8 weeks of treatment were enrolled into cohort 2 to receive ledipasvir–sofosbuvir plus ribavirin for 12 weeks. The patient with on-treatment virological failure had discontinued treatment at week 2 due to meeting the predefined stopping criteria of a confirmed >1 log increase in HCV RNA from on-treatment nadir (baseline HCV RNA was 4.95 log10 IU/mL, week 1 was 2.42 log10 IU/mL and week 2 was 4.75 log10 IU/mL). This patient was non-cirrhotic with IL28B genotype TT and, according to pill count, was fully adherent to study drug for 23 days. All 11 sofosbuvir or ledipasvir–sofosbuvir-experienced patients treated with ledipasvir–sofosbuvir plus ribavirin for 12 weeks achieved SVR12 (11/11; 95% CI 72% to 100%). Among interferon-experienced patients treated for 12 weeks, the SVR rates were 94% (34/36; 95% CI 81% to 99%) without ribavirin and 100% (38/38; 95% CI 91% to 100%) with ribavirin. One patient experienced virological relapse after receiving 12 weeks of ledipasvir–sofosbuvir. One patient completed 12 weeks of ledipasvir–sofosbuvir and achieved SVR4, but died 84 days post-treatment; the cause of death is unknown. Among treatment-naive or interferon-experienced patients, the addition of ribavirin did not substantially affect overall SVR12 rates (90%–100% with ribavirin and 94%–98% without ribavirin). In addition, among treatment-naive patients, SVR12 rates observed with 8 weeks of treatment (90%–95%) were similar to the SVR rates achieved with 12 weeks of treatment (98%) (table 3). In particular, 8 weeks of ledipasvir–sofosbuvir without ribavirin was highly effective in non-cirrhotic patients with an SVR12 of 97% (figure 3A). 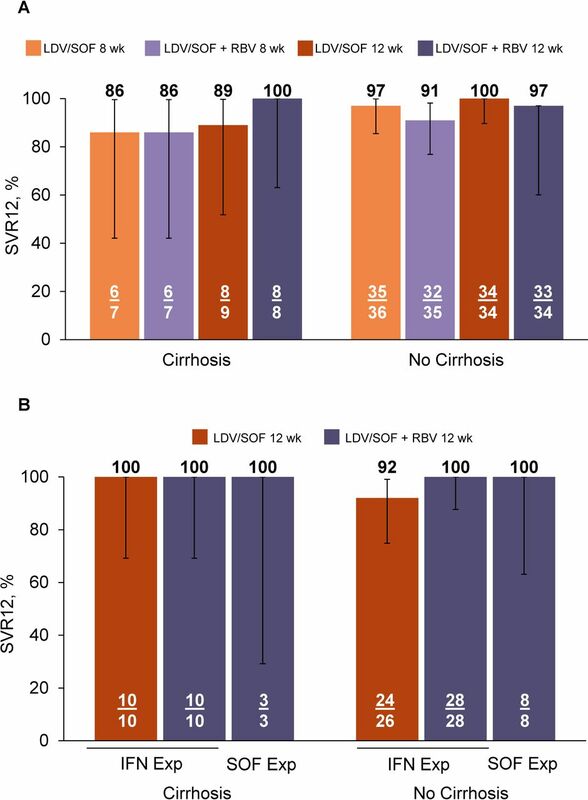 Cirrhosis status had no impact on observed SVR12 rates in interferon-experienced patients treated with ledipasvir–sofosbuvir for 12 weeks with or without ribavirin (figure 3B). Other baseline characteristics including IL28B genotype, baseline HCV RNA and response to prior HCV treatment had no impact on treatment outcome (table 3). Proportion of treatment-naive patients (A) and treatment-experienced patients (B) achieving SVR12 according to cirrhosis status. Error bars represent 95% CIs. All patients who did not achieve SVR12 experienced virological relapse except: one treatment-naive patient who received LDV/SOF+RBV for 8 weeks (on-treatment virological failure), one treatment-naive patient who received LDV/SOF+RBV for 12 weeks (relapse after early discontinuation due to a serious adverse event) and one IFN-experienced patient who received LDV/SOF for 12 weeks (achieved SVR4, but died prior to post-treatment follow-up week 12). EXP, experienced; IFN, interferon; LDV, ledipasvir; RBV, ribavirin; SOF, sofosbuvir; SVR12, sustained virological response at 12 weeks post-treatment. Adverse events and laboratory abnormalities by treatment regimen are shown in table 4. In total, 37% of patients (16/43) receiving ledipasvir–sofosbuvir for 8 weeks, 52% of patients (22/42) receiving ledipasvir–sofosbuvir plus ribavirin for 8 weeks, 41% of patients (32/79) receiving ledipasvir–sofosbuvir for 12 weeks, and 63% of patients (57/91) receiving ledipasvir–sofosbuvir plus ribavirin experienced at least one treatment-emergent adverse event. The most common adverse events were headache (occurring in 9%–31% of patients by treatment regimen), fatigue (9%–15%) and anaemia (0%–8%). Overall, one patient discontinued treatment due to an adverse event. This patient, a treatment-naive 43-year-old man receiving ledipasvir–sofosbuvir plus ribavirin for 12 weeks, discontinued treatment on day 56 following a road traffic accident resulting in leg amputation. Serious adverse events were reported in three patients, all three of whom were receiving ledipasvir–sofosbuvir plus ribavirin for12 weeks. One patient, a 47-year-old man, suffered acute atypical chest pain of unknown aetiology on day 11 of treatment. Two patients were involved in road traffic accidents, one on day 17 and the other as mentioned above on day 56 resulting in leg amputation. None of the serious adverse events was considered treatment related. One 58-year-old male interferon-experienced patient treated with ledipasvir–sofosbuvir died of unknown causes during the post-treatment period and was not considered related to study drug. Twenty-seven patients had laboratory abnormalities (ledipasvir–sofosbuvir for 8 weeks, n=3; ledipasvir–sofosbuvir plus ribavirin for 8 weeks, n=3; ledipasvir–sofosbuvir for 12 weeks, n=6; ledipasvir–sofosbuvir plus ribavirin for 12 weeks, n=15) (table 4). Most laboratory abnormalities occurred only at one study visit. The most common abnormality was decreased haemoglobin levels 8.5 to <10 g/dL, all of which occurred in patients who received ribavirin (8 weeks, n=2; 12 weeks, n=7). One 57-year-old male patient receiving ledipasvir–sofosbuvir plus ribavirin for 12 weeks with a history of diabetes mellitus experienced hyperglycaemia. Overall, the rates of adverse events were lower among patients receiving ribavirin-free treatment for 8 or 12 weeks (37% and 41%, respectively) than among those receiving ribavirin (52% and 63%, respectively) (table 4). The safety profile of the ribavirin-free regimens was similar regardless of treatment duration (37%–41%), whereas a greater proportion of patients in the ledipasvir–sofosbuvir plus ribavirin 12-week group had adverse events (63%) compared with the 8-week ribavirin-containing group (52%) (table 4). Of note, anaemia was observed only in patients who received ledipasvir–sofosbuvir plus ribavirin (7%) and no patients treated with ledipasvir–sofosbuvir alone. This is the largest phase III trial evaluating a single tablet direct-acting antiviral regimen in patients with HCV genotype 4; it is also the largest such study in Egyptian patients. Given the high prevalence of HCV in Egypt and the heterogeneity of the HCV-infected population with respect to age, comorbidities and prior HCV therapy, there is a need in Egypt for a highly efficacious, well-tolerated, single-tablet regimen with simple monitoring. With the widespread use of sofosbuvir, an efficacious treatment for those who have failed treatment with a sofosbuvir-based regimen would also be highly desirable. Among interferon-experienced patients, treatment with ledipasvir–sofosbuvir without ribavirin for 12 weeks resulted in an SVR12 rate of 94%, which is comparable to that observed among genotype 1 patients in the ION-2 study. Although the addition of ribavirin did not appear to provide substantial benefit in terms of SVR rates for treatment-naive or interferon-experienced patients, it did lead to additional toxicity (patients with any AEs 52%–63% with ribavirin and 37%–41% without ribavirin). The limitations of our study include the relatively small number of some subgroup of patients such as patients with cirrhosis. However, this is the largest study published to date on the use of ledipasvir–sofosbuvir in genotype 4 patients. Additionally, the analysis of SVR according to baseline disease characteristics was exploratory. Therefore, the SVR rates observed in some baseline subgroups, such as the treatment-naive patients without cirrhosis, should be interpreted somewhat with caution due to relatively low patient numbers and lack of study power. Finally, sequencing analysis of the virological failures was not performed. As such, no interpretation of potential NS5A or NS5B resistance-associated substitutions can be made. In summary, ledipasvir/sofosbuvir for 8 weeks was a highly effective treatment option for treatment-naive HCV genotype 4 patients without cirrhosis. Cirrhosis status did not affect the high SVR rates observed with ledipasvir/sofosbuvir for 12 weeks in interferon-experienced patients, and ledipasvir/sofosbuvir+ribavirin for 12 weeks was highly effective in patients previously treated with sofosbuvir+ribavirin or ledipasvir/sofosbuvir±ribavirin. The addition of ribavirin to the treatment regimen did not provide benefit in terms of overall SVR12 rates but did increase the incidence of adverse events. Ministry of Health and Population [Egypt], El-Zanaty and Associates [Egypt], and ICF International. Egypt health issues survey 2015. Cairo, Egypt and Rockville, Maryland, USA: Ministry of Health and Population and ICF International, 2015. Kadmon Pharmaceuticals LLC. Ribasphere (ribavirin, USP) tablets for oral use. US Prescribing Information. 2014 https://kadmon.com/files/ribasphere-tablets-pi.pdf (accessed 9 Nov 2017). Roche Products Limited. Copegus (ribavirin) tablets for oral use. Summary of Product Characteristics. 2015 http://www.medicines.org.uk/emc/print-document?documentId=19416 (accessed 09 Nov 2017).
. Glecaprevir/pibrentasvir in patients with hepatitis C virus genotype 1 or 4 and past direct-acting antiviral treatment failure. Hepatology 2017 [Epub ahead of print 20 Nov 2017]. Contributors All authors had access to the data and approved the final version of the manuscript. Funding This study was funded by Gilead Sciences Inc. (Foster City, California, USA). Competing interests GS has served as a principal investigator for AbbVie and Gilead. GE has served as a principal investigator for AbbVie, Gilead, BMS and Pharco Pharmaceuticals, and has served as a speaker for Gilead and BMS, and has served on advisory boards for Gilead and MSD. MH has served as an investigator for AbbVie, Janssen and Gilead, and has served as a speaker for AbbVie. RS has served as an investigator for AbbVie and Gilead. ME has served as an investigator for Gilead. RF has served as an investigator for Gilead, Abbie and Pharco Pharmaceuticals. AE has served as an investigator for Gilead, Abbvie and Janssen. RH declares no conflicts of interest. WA-R has served as a co-investigator for Gilead, Janssen and AbbVie. TZ has served as a co-investigator for Janssen and AbbVie. IW has served as an investigator, speaker and on advisory boards for AbbVie, Eva Pharma, Gilead, Janssen, Marcyrl, Onxio, Pharco and Roche. WD has served as an investigator for AbbVie, Janssen and Gilead. The following coauthors are employees of and hold stock interest in Gilead Sciences: KK, BM, AO, SL, DMB and JGMcH. Ethics approval The protocol was approved by an independent ethics committee or an institutional review board according to site-specific regulations. Data sharing statement All authors had access to the data. Correction notice This article has been corrected since it published Online First. Table 1 and affiliation 3 have been updated.